Do you have an idea for a fundraiser? We would love to hear from you! Clipping boxtops is an easy way to raise big money for Wilde. Each boxtop is worth $.10. It may not sound like much, but it adds up fast! So far this year Wilde has earned $2,266 from the BoxTops program. Wilde’s 2014–15 earning goal is $4,000 and we are already well on our way! Check out www.boxtops4education.com for valuable coupons and to learn how you can help Wilde earn even more money via on‐line contests and bonus deals. Wilde receives a portion of your total food bill from eligible purchases. You must have a Kroger Rewards Card. If you do not have a Kroger Rewards Card, you can get one at the customer service desk of any Kroger. 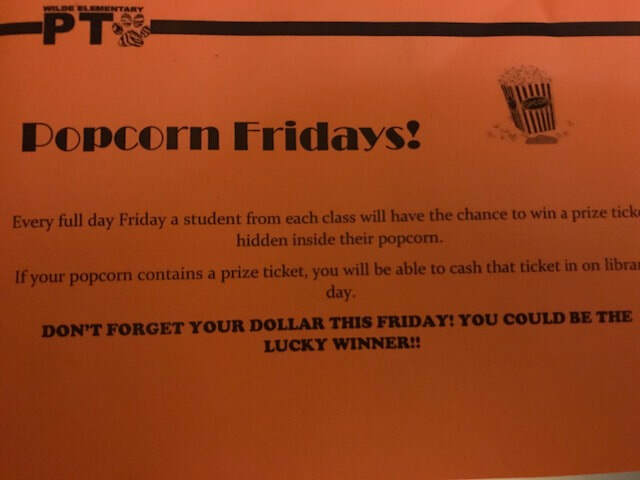 Every Full day Friday we will be selling bags of popcorn for $1.00 to Kindergarten-5th grade. we will also sell some outside after school starting at 3:30!